September 7, 2016 – Newburyport, Massachusetts – UFP Technologies, a producer of innovative, custom-engineered components, products, and specialty packaging, announced a complete redesign of its molded fiber website which features custom packaging made from 100% recycled paper and water. The new website, www.moldedfiber.com, features an improved layout with a mobile friendly, responsive design. The new site also includes detailed information regarding products and services, numerous images, informative case studies and helpful environmental resources. UFP Technologies’ molded fiber operation was founded in 1991 as Moulded Fibre Technology (MFT) in Westbrook, Maine. 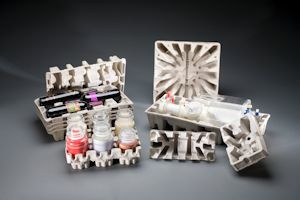 The Company was the first molded fiber manufacturing organization to commercially develop what was traditionally known as the ‘egg carton process’ into custom industrial molded pulp packaging in North America. UFP Technologies’ molded fiber has become the foremost cost-effective, durable and environmentally friendly packaging solution in the market. Due to rapid growth and increased demand for molded fiber packaging, UFP Technologies now serves its customers from strategically located facilities in Iowa and Texas. To learn more about UFP Technologies’ Molded Fiber packaging, visit www.moldedfiber.com.